And fermenting your own veggies is exactly like that, as a couple dozen participants found out this weekend at the South Sangerville Grange. Attending the class provided this woman an “ah ha” moment. She went into the class thinking it was going to be hard and complicated, and left feeling like it was the opposite and that she could do it! Actually she DID do it, right there in the class! But, what ARE fermented veggies? Fermented veggies are a tasty condiment packed with good bacteria and probiotics, not to mention awesome taste! You can ferment almost any veggie, too. A basic definition of fermented veggies is raw veggies transformed through the addition of a little salt into a new food, preserved for weeks or months and enhanced in taste. The traditional example is sauerkraut from Europe or kimchi from Korea. But cultures all over the world have made and still make fermented veggies to aid digestion, improve health, preserve food, and simply create a new and delicious flavor to add to their meals. Plus fermented veggies can help you boost your immune system which is especially important during the cold and flu season! It’s easy: First and foremost, because it is so easy and fun! Like the story above, when people try it and realize how easy it is, they get hooked! Save money: The equivalent product bought in the store can cost $5-7+ per pint. The cost of the ingredients that go into it is, well… much, much less! Customize your flavors to your taste: Like you could add more garlic or take away the garlic. Add spices like curry powder, or even just make it as plain as you want. In fact, that’s how we came up with the easy starter recipe below. We made it up! 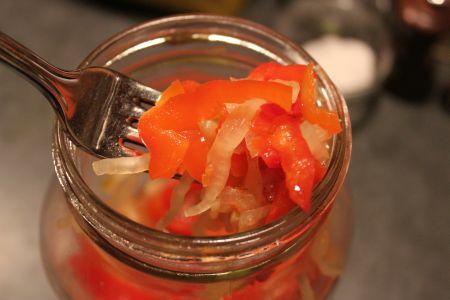 Do you have any peppers saved from your garden or CSA shares that are just hanging around because you’re tired of them and have run out ideas for them? Try this and you won’t be sorry! It was one of the favorites from the taste test at the recent fermenting class! How do I use my fermented veggie creations? Want to learn more? I’ve got one more upcoming fermenting veggies class for the year in November. Check out the details here. By trying this recipe above or by attending my next class you can learn how easy it is to make your own fermented veggies, too!